The 993 are originally equipped with one of two possible types of catalyser. The most frequent is the Bischoff type, with its two oval shaped inlet pipes and its two entry flanges at a 45° angle with the catalyser. The other type is the Gillet, which has rounded entry pipes that are at a 90° angle with the catalyser. This exhaust has metalic, 100 cell sport catalysers. 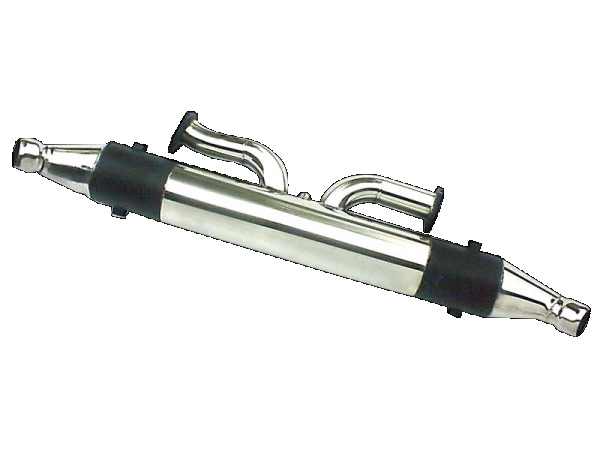 As a replacement for the original catalyser, it will improve the air flow and give a much sportier sound. You should expect a power gain of around 12hp compared with a 993 stock. The same variations exist for vehicles fitted with the Bischoff style cats. Our exhausts all fit onto the original interfaces. By this we mean their entry, their outlet and their size are the same as those of the original part. They can therefore be fitted in replacement of the original part without requiring any modification. The cats fit under the car between the headers and the mufflers, which are in the rear wings. In order to remove the original cats we recommend you unplug the Lambda probe, which is easy to reach in the middle of the cat. The 3 bolts on either side of the entry flanges are often difficult to remove, plan to loosen them up well in advance with a good lubricant. You will need to use a car hoist. It isn't easy to retrieve the Lambda probe so be prepared to buy a new one or have one already to hand. On average, it should take about 2 hours to fit them including the time taken to dismount the original exhaust. It will be faster if the exhaust you're removing is in good condition, just as it may take longer if the reverse is true. Must always be tightened progressively across the whole set of bolts. To ensure that our exhausts are fitted under the best conditions, a mounting kit containing: gaskets, stainless steel bolts, stainless steel lock nuts and high temperature copper grease, is included with your exhaust. It's been 4 months now that I've had a "RIVA" exhaust and catalyser installed on my 4S. I've not been disappointed, above all its exactly what I was looking for, a deep and throaty sound at low revs and when idle leaves nobody unmoved, as my insurance expert said the sound is "bewitching". The RIVA model deserves its name. Happy owner of a 996 C2 from 1995 delivered with an X51 and fitted with a SCART exhaust .... a true delight ! I live in Marseille and each time I go through the Prado Carrénage tunnel it's a moment of pure joy...just to hear the sound produced by the exhaust. Thanks to M SCART for his kindness and his professionalism (met at the Paradis Porsche 2014). I own a 993 Targa. The exhaust needed changing, after having contacted Martin SCART and listened to his advice on the different versions on offer, I decided to fit the "super sound SCA 993 3 2". The sound of the original was already excellent, but this, what a mechanical symphony...I fitted the exhaust a year ago, and each time I take the car out it's the same pleasure to the ear? My thanks once again to Martin SCART and his team for their welcome, their kindness and their great professionalism. Well done to Martin who having given a sound to my ex 3L2 this time set about the job for my Porsche 993. I chose the version with valves which enables me to make a great sound on the country roads and should I so desire, have a more comfortable sound for those long motorway drives. It's a pleasure to hear Martin's good advice, an enthusiastic expert always ready to listen to his customers and offer the best solution adapted to their needs. To be consumed without moderation, it's an excellent remedy for the moral. Hello everyone. Just to introduce myself : Bruno, 59 years old, a Porsche man through and through, owner for the last 8 years of a 993 4S, optimised, specific exhaust. It was 5 years ago when I first called Martin SCART to replace my original silencers by his handmade silencers. Once they were installed the magic began to work both on the sound and the performance. I recently entrusted him to fit a 100 Cell Sport Catalyser which has given me more torque and power ( +20 NM and + 15 HP ) and obviously the pleasure that comes with it. Therefore I can only sing the praises of Martin SCART who for me is more than an Exhaust Musician. This enthusiast who is immensely kind, extremely accessible and whose skills are unanimously recognised should also be considered as a Conductor in that he has succeeded in associating Music and Performance in his instruments. In this jungle where competition is ferocious, I can't allow myself to give anyone advice, but just to let you know that if you "sign up" with RS TUBE, you won't be disappointed as in Martin SCART you will find a REAL PROFESSIONAL who will guide you through the process. A standing ovation for the Artist and Godspeed to all PORSCHE drivers. Regards. Bruno LACHAUD.